It all started last week with allegations of Shoelace Tampering. Then Mabel the Mouse was found dead in the townhouse and all paws pointed at me. Facing a possible murder charge, my future hangs in the balance. Circumstantial evidence is mounted against me, though I continue to maintain my plea of innocence. Click HERE for Shoelace Tampering story. Click HERE for Murder Allegations story. Left: I Have Cat's Petie, chief legal council for Katie, "I am confident justice will prevail and the TRUE killer will be identified." Middle: Scene of the crime inside Katie's townhouse; Mabel Mouse, deceased. Right: Family spokesmouse, Mick, at press conference. "Uh, what are these stick things pointing at my face for?" On Friday, TMZ released case-breaking video footage. Click HERE if you missed it. The mysterious grey haired cat seen through my window has raised reasonable doubt that I may in fact have been framed. Word in the alley is that the mysterious grey-haired cat is a key witness to the crime and being held in protective custody. 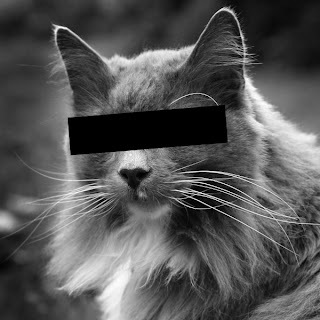 His/her identity has not been revealed, however the cat is rumored to be a well-known master gardener from the Portland, OR area and an expert in mice control. The authorities have identified 7 cats of interest and one dog in connection with this crime. It is not known which or how many are considered suspects. All appear in the above lineup. Can you identify the killer(s)? We are giving away one BlogPaws Full 2012 Conference Pass valued at $199 which includes: (June 21-23) Thursday evening reception, Friday and Saturday general sessions and breakouts, meals, breaks and sponsor exhibit areas. You also get to attend the BlogPaws Nose-to-Nose awards and root for your favorite tuxie cat (hint, hint) to win! Please note: Transportation and lodging are NOT included. Leave a comment with your version of what REALLY happened and who killed Mabel the Mouse. Please indicate that you would like to be included in the drawing and make sure we have your email address so we can reach you if you win. This giveaway is only open to residents of the US and Canada. (Sorry to my friends across the pond...I promise to make it up to you.) Deadline to enter is THIS THURSDAY, MAY 31 at 11:59 pm Eastern Standard Time. Winner will be chosen using randomizer.com and notified Friday, June 1. Even if you don't want to enter the giveaway, we'd still LOVE to hear your version of the truth. We'll be sharing some of the best stories here and on our Facebook Page. 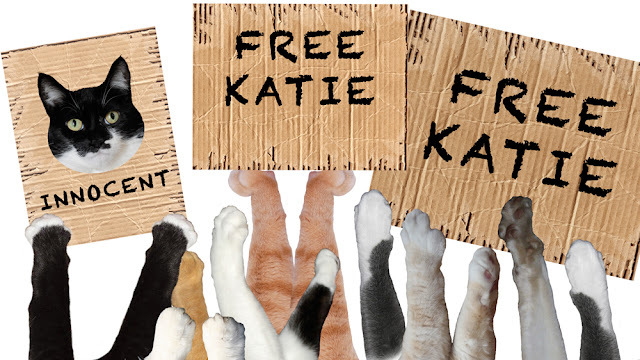 Good luck, and PLEASE... help free Katie. Katie is innocent of these trumped-up charges! We think the vic, died of shock, when it discovered Katie was only allowed one, small piece of salmon for brekkie. We're shocked too. Dismayed even. Good luck Katie! Hmmm...I can smell a rat here. Seriously, I could see that Mabel Mousey died of natural causes. No bite marks, nothing. Maybe the hoomans forgot that they have actually put out some rat poison...and poor Mabel thought it were cheese.... Katie, insist that your hoomans install CCTV at home so no more disputes in future. purrr....meow! Oh come on - it is SO obvious that it's the dog's fault! It is ALWAYS the dog's fault. You can tell because they are so good at looking guilty. I don't need to be entered because my human registered for BlogPaws LAST year! And all her arrangements have been made. And BTW, Katie, she says that she and your human MUST spend some time hanging out! Sorry Snoopy , but it´s YOU who are guilty fur efurrything ! Well anyone looking into Katie's beautiful eyes can plainly see she couldn't POSSIBLY be the murderer...in fact, I don't think there was a murderer at all! I think Mabel died of natural causes. It happens. We all have "our time" and hers arrived, her little body was discovered, and it was ASSUMED (NEVER assume!) Katie had done a dirty deed. I'm sure once the pathology report is made public, Katie will be vindicated and all will be right with the world again. Hmmmm! This needs some consideration. The evidence is obviously purely circumstantial. I think it could be mooted that Mabel Mouse committed suicide just out of sheer spite. After all Katie is a well loved puss and Mabel was a very jealous mouse - always was. Has the ME done a toxicology report? Come on this is basic stuff!!! However, looking at the lineup I have serious doubts about kitty no 8? I mean it sure looks like he might have something to hide! Cuckoo-in-the-nest syndrome at the very least! Think on it. There is a lot more to this than meets the eye. We're sticking to our story that the mousie did it...trying to frame Katie. We all know mousies are NOT very smart at all!! This stoopid mousie definitely didn't think the whole thing through. Our mom would love to go to Blog Paws. Well, Katie is's obvious you didn't do it because your eyes spell honesty! I suppose the dog could have done it, but he would have shaken the mousie and there would be bite marks. I still say it was Gloman. Yup - it was Gloman with a quick blow to the head with a broom. Oh, I'd love to go to Blog Paws, but probably couldn't handle traveling that far, so let someone else have the opportunity. We would put our money on the mysterious gray haired cat. He looks suspicious for sure. Don't enter us in the drawing, because the Mom will still be helping out with the baby then, she is sure. Have a great time at Blogpaws, though, Glogirly!!! The members of the feline terrorist group, Al Qkitty, 9 of them to be exact, arrived on the scene of the crime prepared to dispatch..and eliminate Mabel Mouse from the face of the earth. When they arrived...they were not alone. Off in the distance we...uh I mean they saw precious innocent Katie sound asleep. Other felines from the blogosphere were already there! We all ran after Mabel...but then we saw this big hairy woofie. The woofie stepped on Mabel and that was it. It was an accident. We would love to claim responsibility...say it was our magnificent claws that did her in. But no. So before we left we put the poison bottle in her little mousie paws and left...and a certain member of our group lingered at the window. pee ess...we already "like" you on FB! pee pee ess...if mom wins...can she go to Blog Paws virtually???? Cody here! Wasn't me and for the record my buddy Snoopy would NEVER do such a thing...sorry but this household LIKES DOGGIES!!! Got an issue with it? Take it up with our barking Sheltie Dakota...who just happens to be the most handsome dog in the blogosphere (next to Snoopy of course, and is one of Snoopy's best buds) Our human brother-in-law is an attorney and will blast that theory out of the water. Obviously don't enter us in the give-away, we have been all set for quite some time now. just a reminder...the pass DOES NOT INCLUDE THE COST OF AIRFARE OR HOTEL....(sorry, I know you said it but it is IMPAWTANT)!! Don't worry Katie I'm formulating a plan to bust you out as a back up and you can hide out here with me!lol Speedy! I certainly believe you have been framed! But who stands to gain by your imprisonment? Who really gains by the death of a mouse? In matters of justice, eye witness testimony is not always accurate. We have one likely culprit, who is a serial killer named Odin but he refuses to sign a confession. We liked you and you have our email. PS: Leave me out of the drawing. I think Harry the Farm cat snuck up there, dropped the mouse for Katie as a gift. He usually gives them to the chickens to eat but he might be trying to impress a female Tuxie cat. Cool Contest. I already bought my ticket, but I love mysteries! That mouse corpse is too pristine to have been murdered by a kitty or a dog. no blood, no punctures, no torn fur, no drool matted fur. I suspect that mouse ate some poison outside, then entered your house to die. I suspect he wanted to frame a kitty for revenge of mice all over the world and your house was easiest for him to enter since the resident kitty (Katie) was asleep. The dog did it, they are always trying to frame Innocent cats. They have spent years trying to convince humans not to like cats. Them movie “Cats vs Dogs” was pure propaganda designed to put cats in a bad light. With no marks on the body it is apparent that the mouse was suffocated. The dog caught the mouse in its mouth closing it tight, then breathing through its nose it was able to deny the poor little mouse of air. This in-turn caused the mouse to pass out before dying, thus there is no evidence of a struggle or marks on the body. Test the fur for DNA and saliva, you will find that it had dried before the human came home. This is not an entry I would not be able to attend, thank you. What can I say?! I'm SO shocked to see myself here in this line up!! I'm completely innocent, to start with I think I've previously put on record I've never even seen a Mouse, let alone killed one….. But the best bit - I have an alibi - I believe I was out running with my Mum and Cosmo at the time of the murder PLUS I think those Al Qkitty's have already confessed, and there's no way they'd have a DOG in their group!! Oh for heavens sake. I go away for one weekend to visit my brother and his family in PA and come home to find Zoey as a potential murder suspect... Since I cannot vouch for her whereabouts, I am just going to have to vote for the most obvious choice - that really big and hairy cat, #8. No need to enter us in the contest! Well, I have maintained along that Gloman is guilty, guilty, guilty! Here's what happened. For months now, a sick jealousness has burned inside of Gloman. He wanted all of Glogirly’s love to himself. All of those times he was pointing the camera at Katie…he was pretending it was a gun. Finally he put his evil plan in action. After carefully coating his shoelaces with a delayed release sleeping potion, he left them out for Katie to chew on, then suddenly “remembered” an out of town assignment. As soon as Glogirly left the house and once the sleeping potion kicked in, Gloman snuck back into the house and planted Mabel, who had died of natural causes in a lab. Katie – I think that you should go into protective custody until we can get Gloman on some medication. I can’t go to Blogpaws, but good luck to those of you entering this neat contest. So much better than anything I would have thought of!! So fun! I think it's everyone except #1, who's not guilty by reason of her innocence. I have an alibi. All further comments will be made by my mouthpiece Mr. Tuna "R'son" Katt. I'm sorry. I couldn't think straight... I was LOL-ing at the pictures... the crime scene... and Katie's predicament! Free Katie! Free Katie the Cat! She's innocent (giggles)! Me hates to frame my brother Kozmo, but me knows he did it! Do not believe his goody two shoes front! International Man Cat of Mystery who does only good! Me has seen him murdering mice! Almost every time he goes out the back door, he heads out on safari and slaughters at least 4 innocent little mouseys! Me has also seen him taking off through the tunnel on unauthorized trips and me knows he has NOT been visiting Callie! When he visits online, he has even made comments about how much he likes other girl cats! He leaves mousies in fornt of the door for our Mommy and Daddy showing them hoe much he cares for them...purrsonally, me thinks he has gone and lefted a mouse in front of your door to show yous how much he loves yous!!!! And that's what me thinks! PS Me already "likes" yous on facebook and Mommy and me can't go to Blog Paws, bit me wanted yous to know the REAL TRUTH!!!! 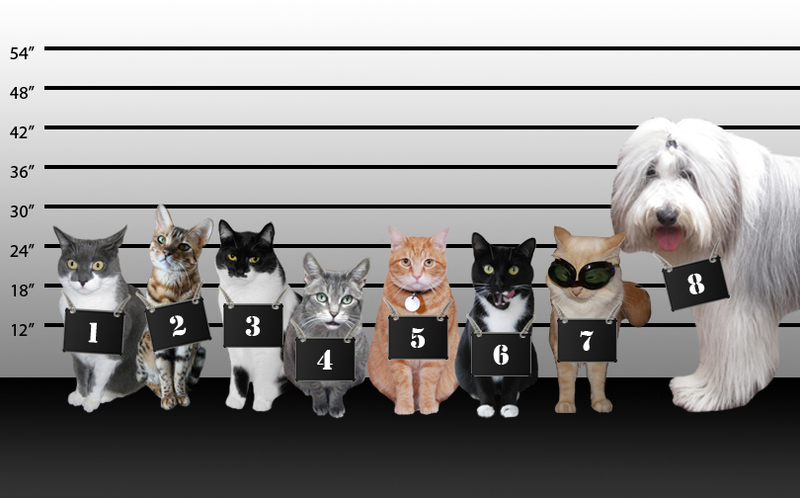 We don't think the perp is in the line up! BTW, the mom has been playing with avatars and figured out how to do kitty ones! She is really excited. Oui Oui's is up today. And she is going to show all of them soon. She can't wait to see how you do them, maybe you have better ideas, and easier ways. Katie this just gets more intriguing to us. The line-up looks like a frame-up for you & all the innocents numbered 1 through 7. Ummm....is #7 marking territory or is it just us? Anyway, #8 looks rather big & clumsy with those paws and mouse murder is a delicate matter. There may be an unknown interloper at work here. We thinks Glogirly did it. But she isn't in the line up.